No sleep and Chalupas at 3a.m. 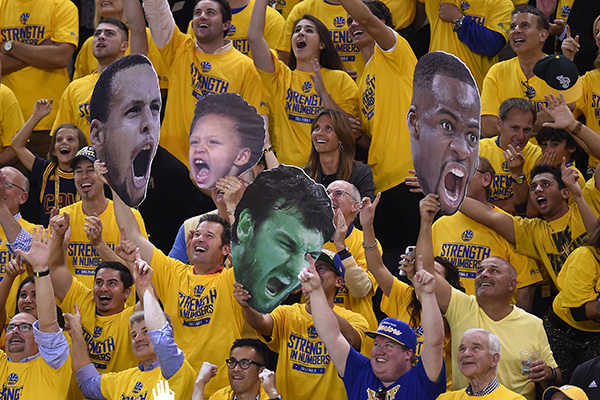 Fans wave face cutouts of Golden State Warriors' Stephen Curry (30), his daughter Riley, Golden State Warriors' Andrew Bogut (12) and Golden State Warriors' Draymond Green (23) in the fourth quarter of Game 1 of the NBA Finals. I had only slept three hours the night before because I had to catch a 6 a.m. flight to Ohio from Oakland. Our three-person team of Nhat Meyer, Ray Chavez and I were arriving to the arena eight hours before the game even started. We had to get there early to set up our five remotes: one remote with a 50mm, one with a tilt-shift lens, one under the basket with a wide-angle lens, one remote on the bench and one remote on center court. I kept telling myself I hope these remotes work because it’s a lot of gear to carry across the country. The toughest part of covering the NBA Finals is the lack of sleep. I started covering the Warriors when they played the Houston Rockets in the Western Conference. Lots of early morning flights. Sometimes I got three hours of sleep, sometimes seven hours and sometimes I got none. What worked best for me was to keep to my sleeping schedule on West Coast time and sleep as much as I could on the plane. Now the second hardest thing covering the NBA Finals was trying to stay creative while shooting multiple games. Our editors were placing proofs of the pages they designed on a wall back at our office. It was a great way to keep an eye on our images and to keep us from using the similar photo again and again. Now back to Game 6. We had a deadline of 9:30 p.m. West Coast time. Depending on TV timeouts and regular timeouts this was going to be close. So you don’t have time to download your 1,000 or so images. Best thing to do is put the cards into the reader and browse your tagged images. Caption only the best images and send them fast! Everything happens fast but experience teaches you when to stop and look around. I was always taught to keep an eye on the edges. So I look for happy fans, sad fans, shoot wide, shoot tight, and don’t forget to keep an eye on the clock. In the end it was over in six. Time to pack up and go home. It was 3 a.m. and I had a flight at 6:25 a.m. No time to sleep so a quick trip to Taco Bell at 3:30 a.m. for some Chalupa Supremes and head to the airport. What you remember the most about trips like this are the special bond you have with your colleagues and other photographers. Nhat Meyer and I have covered four World Series, two Super Bowls, and now an NBA Final. I cherish the time I had experiencing these incredible moments and I feel blessed to have a job that I love. Jose Carlos Fajardo is a staff photographer with the Contra Costa Times. Wally Nell says 'Quality is just an excuse for lack of quantity!' Go Springboks!!! ::..